If you ask Nomura, then France will win the World Cup. Meanwhile, UBS chose Germany, and ING, Spain. With face-reading software, they just analyzed the images of 4,000 football (soccer) players and concluded that expressive individuals would fare better. Angry-looking men would probably give up fewer goals while happy ones had the confidence to score more. So, with the World Cup soon to begin, and predictions in the news, let’s see where else we should look to decide who can win. Next, we can look at popularity. Telling us that interest helps countries create good teams, The Economist describes a popular kids’ football program in Uruguay. Also reflecting “demand” for football, they found that Africans focus on it much more than any other sport in Google search. And we can ask if affluence makes a difference. Richer countries do tend to do better at football because they can allocate more facilities, equipment, and medical support. In Africa’s poorest nations, we have players who first have to cope with malnutrition, fewer qualified coaches, and inadequate healthcare. Size is another possibility but it too won’t guarantee success. 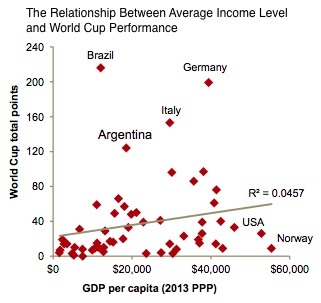 Just because a nation has a lot of people, you won’t necessarily have more football stars. Take the U.S. Here we have the affluence but we also have the options. Because there are so many choices, our large population does not create those increasing returns to scale for football (soccer). Applied to developing nations, the “trap” just means a country’s growing economy has stalled. At first, a country quickly ascends the development ladder as it adopts existing technology. But then wages go up and returns from capital fall. Unable to rise further, it stays in the mid-range. Like the developing world, we have teams copying what others have done. They adopt successful training techniques and improve their infrastructure. Meanwhile, human capital is globally mobile and knowledge can easily be transferred. The rules among different regional organizations are similar. Here though is the point at which the “trap” can set in. Moving beyond the convergence stage can be tough. So let’s conclude where we started with those angry and happy faces. They might be the most dependable way to decide if a team will be great enough to win the World Cup. My sources and more: Thanks always to marginalrevolution for another interesting link. It took me to The Economist and then the academic perspective, here and here. At this point the reading started to multiply, ranging from theringer to PWC and Goldman Sachs. But if you go to just one article displaying the humor and hopelessness of predicting a winner, do go to FT.
To improve clarity, this post was edited after publication.